Facebook vs. Instagram vs. Snapchat: Which Stories Feature Is The Best? If you open your Facebook app right now, you might notice something different. If you look at the top of your home page, you’ll see a few circles with your friends’ photos in them—a design that looks familiar if you’re an Instagram user. 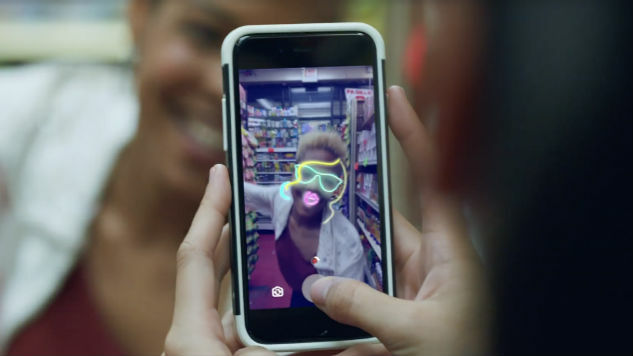 By clicking on one of the circles, you’re shown a video of multiple—ahem—snaps, that showcase photos and videos, some which may have a funny filter, mask, sticker or frame hovering around your friend’s selfie. If you tried to find this video 24-hours later, you’d be out of luck because it will have completely disappeared. Disappearing videos with silly, interactive masks and filters—that’s pretty cool, right? That’s some innovative, unique stuff, but isn’t that what Instagram Stories is? Okay, it makes sense that Facebook would integrate the successful Stories feature onto its platform since it owns Instagram. And sure, they changed the filters, stickers and frames a little bit to cater to the less hipster audience that Instagram Stories already has in the bag. But, let’s not forget one thing: Facebook camera (also known as “Messenger Day,”) is a copycat of Instagram Stories, which was a complete rip-off of Snapchat. So now we’ve got three versions of the same idea—what exactly are Snapchat, Facebook and Instagram doing differently that draws in people to use either app? And is one really any better than the others? Let’s find out. Let’s start with what Facebook actually does well with it’s Snapchat-look-alike, Facebook Camera. Upon first impression, it’s simple design is relatively easy to use, something that I think will make Facebook Camera do well with million of Facebook users who may have never used Snapchat, or couldn’t really figure it out. Though I love Snapchat, it can be tough to pick it up the first time you download it, especially if you’re from the older generation and don’t really understand the point. Take my parents, for example, who called me multiple times asking me to explain what a filter was and how they could make their face “look like that bee thing.” Facebook Camera simplifies the process a little and there doesn’t seem to be much delay in getting it to recognize you, which makes for a seamless and more enjoyable experience as you swipe through the masks and filters. The masks and filters really are the big difference that Facebook changed and there are some cool ones, mostly due to some partnerships that allowed them to turn you into Rocket Raccoon from Guardians of the Galaxy or an annoying Minion. Moreover, if you don’t want a video or image to just add to your story and disappear in 24 hours, Facebook gives you the option to also post the content directly to your Facebook wall. It may sound like a simple gesture, but it’s convenient and avoids the headache of posting something and then later realizing you wanted to post it to your wall and not your story. Though the filters and masks mix things up and give you different options that Snapchat has yet to offer (in some cases) I find them to overall be pretty boring. Mainly, the problem lies with the graphics, which just aren’t impressive and are frankly pretty boring. Besides the Minion and Marvel characters, the other designs seem totally random and weird, but not in a good way. Moreover, the filter options have a low quality to them as well and remind me of the native camera-editing app on your smartphone. The filters are trippy and remind me more of playing with Photo Booth when I was in middle school. Instead of making me want to take photos and share them with my friends, Facebook Camera doesn’t have a brand or aesthetic that makes you want to post in the way Instagram inspires you, or Snapchat just makes you want to laugh. Though fun to play around with at first look, Facebook Camera ultimately feels boring and rushed, which I suppose isn’t all too surprising (though I’m sure the app will improve and update its stickers over time). I will, however, be curious to watch my parents and grandparents use Facebook Camera and share videos and photos from their day. I want to say that’s a pro for right now, but that might turn into a con later. Instagram Stories is the fancier version of Facebook Camera and Snapchat, which I say in an optimistic manner because I think Instagram does a really good job at catering to its intended audience of photographers, professional, amateurs and wannabes alike. My personal favorite feature of Instagram stories is the marker, which lets you effortlessly draw or write text. I use the word “effortlessly” because even if you don’t have the best handwriting, the app makes it look nicer than it is, which is makes a lot of people’s content look more pleasing. Moreover, the filters are the ones you’re used to on Instagram, so there’s something nice about having the option to use filters you actually want, instead of weird, trippy ones that don’t make sense. Instagram Stories also recently added a feature that allows you to create a highlighted text block, which was a smart move because I see people using it all the time in their Stories. It’s a sleek, simple addition to the text option that gives your photo a cleaner look, as opposed to the transparent, long line box that fills the screen and sort of ruins the aesthetic of your photo. Another huge pro to Instagram Stories is the different capture features: Live, Normal, Boomerang, and Hands-Free. Boomerang makes Instagram Stories a lot more fun and can break up a feed so that it’s more interesting and quirky. The “Live” option is surprisingly entertaining, especially when artists or entertainers use them without notice, as it feels like you’re getting a VIO behind-the-scenes look of their lifestyle or a project they’re working on. The biggest con to Instagram, which keeps Snapchat users loyal, is that Instagram has yet to master (aka copy) the filters and masks that make Snapchat so fun and engaging. While I’m not hoping Instagram just copies Snapchat and makes those available, (especially now that we’ve seen Facebook’s somewhat boring options), I’d be interested to see what Instagram would offer. The other lacking feature on Instagram Stories are the stickers, which fail to really be all that useful or fun. Sure, there are an array of sunglasses and hats that you can use to “dress up your selfie” but it’s rare that I ever see people use those. The most used sticker is probably the one-heart like sticker, which makes sense, given that the platform is Instagram. Instagram Stories also copied Snapchat’s geo-filters, but only users in New York City and Jakarta have had access to them. Snapchat was the first ephemeral app on the market, which means everything else that came after will undoubtedly always be compared to how Snapchat mastered sending snaps in such a fun and quirky way. When I find myself posting to Instagram Stories and Snapchat, I always find myself sharing the content I find funny on Snapchat because the app is designed to inspire me to do so. Even though we’ve used them hundreds if not thousands of times, turning yourself into a dog, or morphing your face and changing your voice with a Snapchat filter is still so entertaining. Probably one of the biggest reasons Snapchat continues to do well too is its brand partnerships and subscriptions. In this day and age, so many people are getting their news and entertainment through social media apps, and Snapchat’s platform combines both with high-quality content. It’s really easy to get stuck on the app for long periods of time because there’s always something new to look at, both form your friend’s list, or from Snapchat partners. It seems there are ads everywhere on Snapchat these days! Though it’s really easy to skip them, they’re just annoying and I feel like I’m always seeing the same ones all the time! Moreover, though there is a lot of high-quality content being produced on Snapchat, it’s sad to see an influx of clickbait and irrelevant entertainment news as well. I’m sure that has more to do with the publishers who are creating these stories, but sometimes it feels that the content platform looks a whole lot like Buzzfeed. Overall, the more I use Instagram Stories and test out Facebook Camera, the more I’m realizing just how confusing Snapchat can be to navigate. Even though I’ve been using the app for years, I still find myself clicking around to get back to my home screen or find myself accidentally watching someone’s story. Plus, though I understand Snapchat wants to remain true to its origins; the chat feature could use an upgrade. Sometimes I send something or don’t hear back from someone until later and I forget what the photo or video was. It’s a silly issue, but with such strong competitors threatening the app, you would think Snapchat would start cleaning itself up a little bit. Ultimately, as much as I love Snapchat and will always support it for being the original creator of ephemeral videos, I have to say that Instagram Stories has taken the lead. Though it’s not as fun and witty as Snapchat, Instagram Stories has really upgraded it’s features and seems to understand its users best. Sure, it’s catering toward the more hipster social media users of the world, but it’s doing a great job at being both for hipster photographers, and normal people who just love sharing stuff on Instagram. The more we use Instagram and enjoy it, the less we feel drawn to share stuff on Snapchat—except for going back to take our daily dog-eared photo and see if any new face filters have been added.